When you are living in recovery from your addiction one of the first things that you will want to do or need to do is set up a personal development plan. This plan will have many great things in it including how you will continue to stay sober, how you plan to make progress in your life and much more. You will also want to include how you will use holistic measures and natural treatment options to keep up with your recovering lifestyle. One of the types of options that have not been talked about nearly enough is motivational interviewing. This type of interviewing has been used in many rehabs and even outside of rehabs as well to help sober and recovering addicts achieve specific goals that they have in mind or that they have set up for their recovery. Do you want to achieve the goals that you have for your recovery? If so, learning more about the motivational interviewing process can help you greatly. How can motivational interviewing help reduce negative consequences? When you are in recovery from your addiction motivational interviewing can be a great part of your personal development plan. In fact, one of the many ways that this type of interviewing process can help you is that it can reduce negative consequences. The way that this works is that it teaches you to become more motivated about the interests that you have in life, the ones that are healthy for your life hence leaving negative consequences in the dust. If you take less part or no part in the negative activities, you have greater chances of avoiding the negative consequences of addiction. How can motivational interviewing help you to change in recovery? Another way that motivational interviewing can help you in recovery is that it can help you to change. For recovering addicts, one of the main focuses in their recovery is to make changes that are healthier for their life. During the process of this type of interviewing you will learn more about what changes you want to and need to make, you will analyze those changes and then you will set up plans to make those changes happen. Then the action part comes into play. How can motivational interviewing take care of reluctance you have in recovery? There are many recovering addicts who are reluctant to make changes or they are reluctant to let go of the past. This can cause many problems in recovery. However, if you would like to prevent these problems then when you create your personal development plan you may want to include the use of motivational interviewing. This will give you the chance to practice being motivated about your life and help you to realize that the changes you will make in recovery may be scary at times but they are good for your life. How can motivational interviewing work with setting and reaching goals? 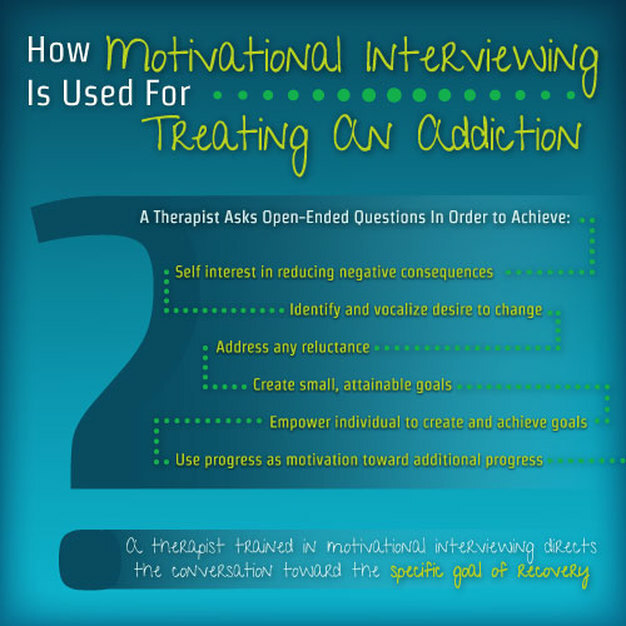 There are a few more things that motivational interviewing can help you with while you are in recovery from your addiction. When you are using this type of interviewing in recovery you will see that it can help you to learn how to set up smaller goals that are more attainable. These types of goals are more attractable to recovering addicts because it helps to improve the confidence that the goal will be able to be reached. With these smaller goals, the recovering addicts have more power over what happens and this can feel amazing. Last but not least, with the smaller goals it seems like more progress is made faster. This progress is a motivating factor that helps to reach more goals and bigger goals in the future. If you are one of the many who are in recovery from your addiction, then feel great about that and be very proud of yourself. If you have yet to find something that works excellent for you in recovery then trying motivational interviewing can be a great idea for you. Even if you have something that works for you, there is no reason why you can’t use multiple techniques to take on your recovery from addiction.